The Magic got off to a quick start, jumping to a 15-5 lead within four minutes. Jameer Nelson was responsible for 10/15 points during the run, knocking down a three and handing out three assist. After New York took a quick timeout, the Knicks got back into the game, ending the quarter strong, trimming the Magic lead to three, with a score 31-28. The Magic was scorching hot from downtown, knocking down six threes in the opening period. Arron Afflalo led the way for the Magic scoring ten points, including a couple of threes in the quarter, finishing with 20 points in the game. The Knicks were able to withstand this in the first quarter, by battling on the boards, getting five offensive rebounds to keep themselves in the game. The Magic continued to pour it on with their three point shooting, with Ronnie Price to open up the second quarter with a three, increasing the Magic lead to 34-28. From this point on the Knicks went on a 15-1 run, powered by some three point shooting of their own. The Knicks knocked down five consecutive threes, which was bookended by Tim Hardaway Jr makes. By the end of the run the Knicks were up by eight, leading 43-35 with 8:00 left in the first half. Each three was came off of great ball movement, with each of them coming off of an assist. Afflalo ended the Knicks run, knocking down a couple of jump shots. At 5:02 Carmelo Anthony got three points the good old fashioned way, finishing an and one to give the Knicks a 51-44 lead. It was a three point shooting contest for both teams by halftime, with the Knicks leading 59-54. The Magic knocked down eight field goals from beyond the arc, but the Knicks would not be outdone, as they made ten three pointers of their own. Both teams moved the ball extremely effectively to get the threes, with the Magic scoring on 18 field goals on 11 assist, and the Knicks scoring 20 field goals on 12 assist. The three point contest did not continue, as the Knicks held the Magic to just six field goals in the third quarter, while continuing to score well, shooting 58.8% in the quarter. The Knicks doubled up on the Magic in the third quarter scoring 30-15 on two separate runs, starting with an 8-0 ending mid-way in the period. Jameer Nelson knocked down a three with 4:04 left in the quarter to cut into the double digit deficit for the Magic, with the Knicks leading 72-63. The Knicks responded with another mini run to push the lead further. The 7-0 was top off by an emphatic Iman Shumpert one handed throw down, to give the Knicks a 79-63 lead with 2:42 left in the third quarter. The lead would bloom to 20 points when Metta World Peace hit an off balance buzzer beating jumper to give the Knicks an 89-69 lead entering the fourth quarter. With it being a blowout game the Knicks’ bench showed no mercy to the Magic in garbage time, more than doubling up on them 32-14 in the final period. The Knicks would have as large of a lead as 41 points, as the Magic were again held to only six field goals in the fourth quarter. 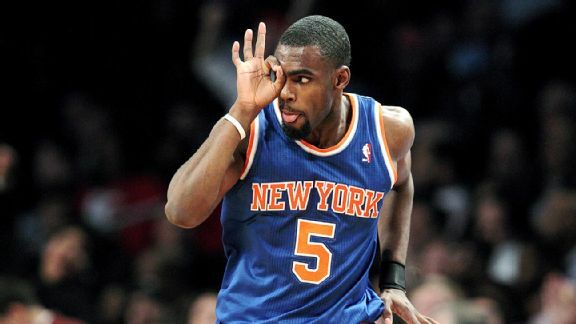 Tim Hardaway Jr., was a one man three point show, knocking down three in the quarter, finishing the game with five threes in total, for 15 points. The 121-83 victory marked the second consecutive blowout game for the Knicks. The Knicks had seven players in double figures scoring, with everyone scoring a field goal that suited up on Friday night, with the exception of Amare Stoudemire, who sat on a back to back game. The Knicks’ bench (57) outscored the Magic’s bench (21) by 36 points. Carmelo Anthony led the way for the Knicks, who had a very effective night scoring 20 points on just 10 field goal attempts. But it was his passing out of double teams on post ups that ignited the Knicks’ great ball movement, collecting four assist along the way. The New York Knicks hope to carry this momentum into their matinee match-up Sunday afternoon in Madison Square Garden with the Atlantic Division leading Boston Celtics coming to town.